A roof has to withstand the elements, and everything the British weather can throw at it all year round. Cement tiles and slate are the two most widely used roofing materials in the UK. Because damage can soon escalate, you should make roof repairs to minor damage as soon as you notice it. If you look up and see this… call a roofing contractor to fix it before bad weather hits. A roof has to be able to withstand extremes of temperature, wet as well as dry weather, wind, ice, frosts, as well as withstanding wildlife and plant life too. Your roof faces a lot of different stresses and strains because of the variety of different weather it has to face. Your roof has to move and flex according to the different conditions it faces, and this movement over time can often cause tiles, slates and ridges to become loosened from the cement holding them in place. Animals, birds and wildlife can also cause damage to ridge tiles, cement work, chimneys and roof spaces, which can cause tiles and slates to slip out of place. Stormy weather will soon blow loose slates and tiles off your roof, causing a danger to people below. In particularly stormy weather, the wind can rip whole sections of roof off your property once a single tile or slate has slipped. 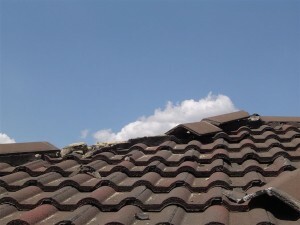 Once the wind can get in to your roof through a missing tile, it has the power to blow your whole roof into the street. One of the most common areas in need of maintenance is the cement flashing around chimneys and brickwork. Once moisture permeates the cement it will soon breakdown following a few frosts and heavy rain. Other roof related problems usually involve either guttering or fascias. Wooden fascias can soon rot if exposed for too long to the elements, and that rot can quickly spread to the roof trusses causing an expensive problem. The majority of homeowners take their roofs for granted, not carrying out any preventative maintenance until they notice a problem. Regular roof inspections can save a lot of money in the long term. An annual roof inspection provides the security you need to know that your property is ready to fend off the worst of the winter weather. Knowing that your home is secure and watertight will give you piece of mind during the harshest of the winter months. This entry was posted in Home & Garden, Home Maintenance on May 3, 2014 by admin.